The ideal plan would have had us leaving Miami, coasting along the gulf stream with 5 knots of northward current, and making it back to North Carolina in just over 2.5 days. That’s with perfect winds, weather, and currents. However, as the weekend approached, it was clear the weather was not going to make that possible. In fact, some cold nasty weather was moving towards the southeastern US. We originally planned to leave on Sunday, but a weather window allowing us to have a nice sail at least to North Florida opened on Saturday. So, we wrapped up our Miami Boat Show projects quickly and prepared for departure on Saturday. We took Virgil ashore so he could continue his boat show work, and said our goodbyes. Then I added gas to the dinghy tank. We weighed anchor by 9 AM. There was little wind, but a glorious warm sunny day at the start out of Miami. 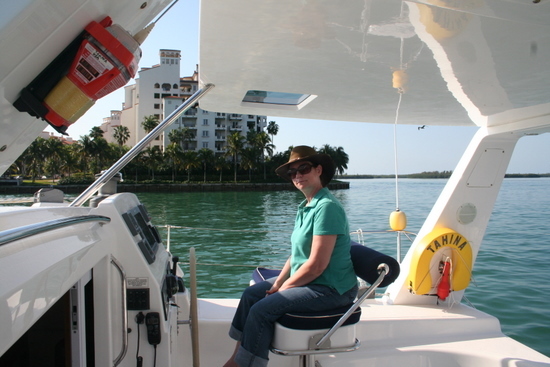 We had a smooth motor out the Miami inlet (Karen was at the helm for a while) and motored our way not far out to the gulf stream. We were soon making over 11 knots over ground thanks to a 3+ knot current. Virgil helped me download some useful charts that proved very accurate for predicting the gulf stream position. Since it was a Saturday, the local fishing and recreational boaters were out in force. But, there was plenty of room for all. I put in new watermaker filters we bought at the show, and we were soon running the watermaker all day. It was important to fill up our watermaker tank with pure water. The watermaker needs to flush itself every few days with about 10 liters of non-chlorinated watermaker water to keep the unit running smoothly. After running all day, the filters still looked brand new (the gulfstream is good clean water). The wind started picking up as predicted just after lunch. A little after 2 PM we pulled out the spinnaker from its locker and rigged it up. We only had about 12 knots of true wind dead aft, but with the spinnaker we were making about 6 knots through the water – thanks to the current we were making 10+ knots. This means the apparent wind was only 2 knots. We were close to sailing at wind speed! We soon turned off the engine and the sail was glorious! Beautfiul sunny skies, deep blue gulfstream ocean water, smooth seas, and an awesome multi-colored spinnaker flying. 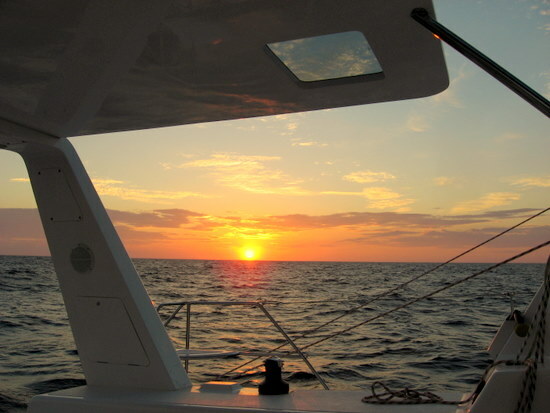 A perfect Valentine’s Day sail up the coast of Florida! The wind was gradually picking up a bit, and an hour later we were making 11-12 knots over ground. This continued through to sunset, but the winds were starting to clock westward. We knew the winds were to clock further, so we lowered the big sail right after the beautiful golden sunset. A short while later we raised the mainsail and were on a broad reach continuing north. Due to rainy weather near north Florida, and some nastier weather coming north of Florida and off the Carolina coast, we decided we would pull in to St. Augustine to wait for the weather to pass. Unfortunately, the forecast said there was another system just a couple of days behind the first one, so we would have a tight window to make it home. As the night progressed, the winds continued to clock around. Oh, and the temperatures started dropping. We were soon back to long pants, sweaters and coats. Because we needed to head NW towards St. Augustine, we had to leave the gulftstream, and we soon had the wind on our nose. It wasn’t too bad, but it slowed us down a knot. Early in the morning, the winds clocked enough to let us raise our sails again, and we sailed the rest of the way into St. Augustine. 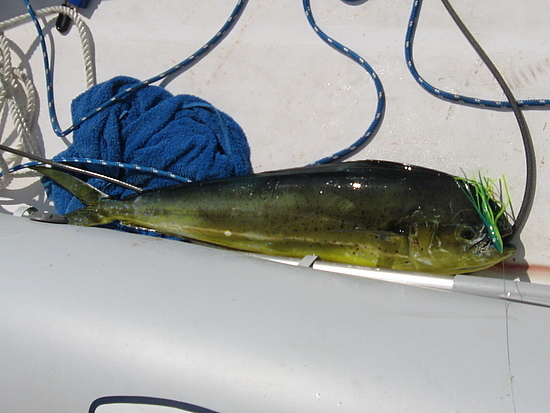 We arrived about 3 PM on February 15th – 221 nm from Miami. After laying anchor, and calling friends/family to let them know we made it, Karen and I both took a short nap and then took showers to go ashore for some dinner and to get Internet access to check on the weather. The weather forecasts were not looking fun for our final run home. The forecast was saying we would need to stay close to shore (the winds would be even stronger further out), and they would be clocking to stay right on our nose even as we curved along the southeast coast. But, it appeared we could make it to Carolina Beach just before another storm system arrived. More on what actually happened in the next post. This entry was posted in Passages, Sightseeing. Bookmark the permalink.